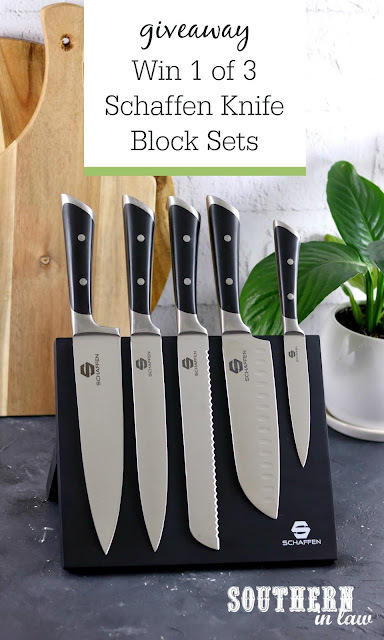 Last week I shared a giveaway where you could enter to win 1 of 3 Schaffen Magnetic Knife Block Sets - and today, I get to announce the winners! This knife block is seriously one of my favourite things in the kitchen - and it's definitely my most used. Rather than a standard wooden knife block which can become overrun with mould (because those tiny knife slots are impossible to clean - and you can't even see if they're mouldy inside 😬) - this magnetic block is not only more hygienic, it's nicer to look at too! and will give you 60% off your purchase - making the full knife block set with all of the knives just $159.98 including shipping! This offer is only valid until April 21st, 2019.